This marine tank represents a basic model for a beginner in sea water. 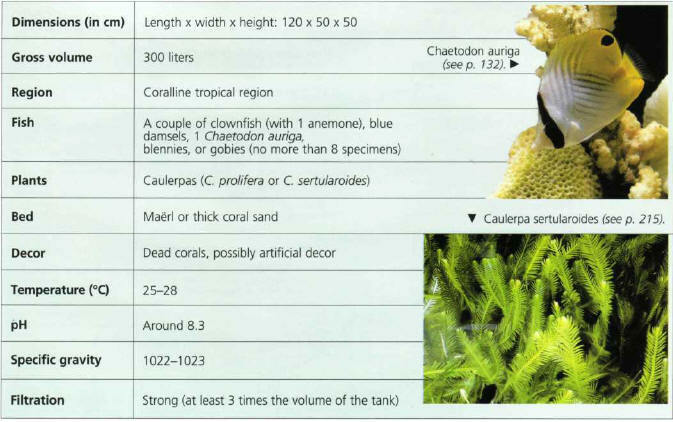 The species proposed are robust, and their behavior provides a fascinating show, particularly the clownfish in their anemone, which may be able to reproduce. To diversify the animal population, you can add a shrimp or a hermit crab. It is also advisable to put in live rocks, which will contain small invertebrates. An artificial decor that includes coralline sand and even small pieces of coral is pleasing to the eye, and can be colonized by caulerpas. This type of aquarium requires impeccable water quality to guarantee its equilibrium. ГОРНАЯ БОЛЕЗНЬ , развивается в условиях высокогорья вследствие снижения парциального напряжения атмосферных газов, главным образом кислорода. Может протекать остро (разновидность высотной болезни) или хронически, проявляясь сердечной и легочной недостаточностью и другими симптомами.